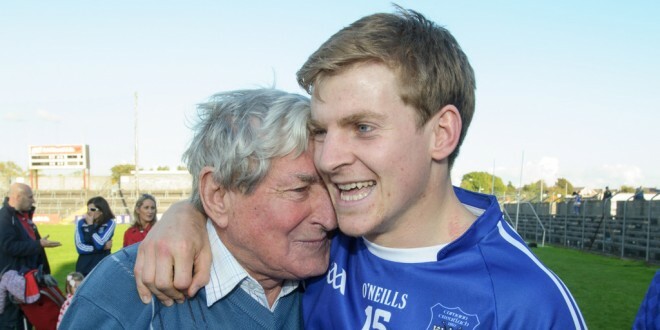 Podge Collins of Cratloe is hugged by his grand dad Cyril Collins of Kilmihil following the win over Eire Og in their senior football final at Cusack park. Photograph by John Kelly. 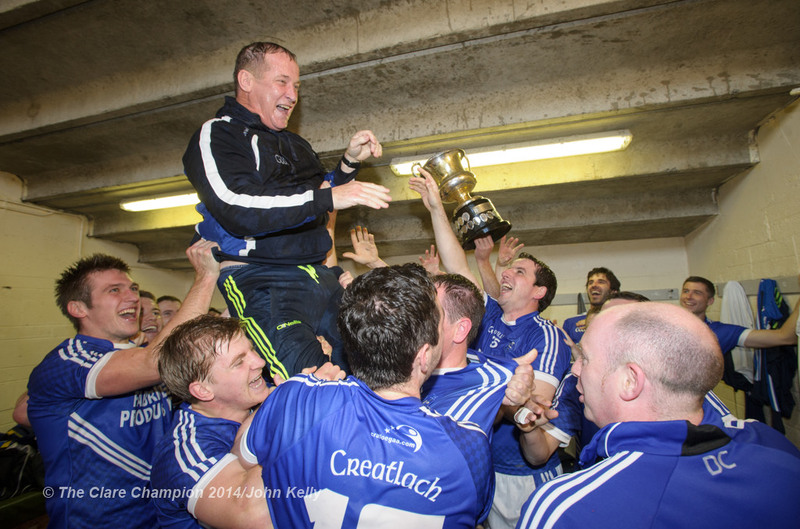 NOT alone did Cratloe retain their Clare senior football championship title in front of 7,100 people in Cusack Park on Sunday, they became the first club to complete the double on the field since 1914. 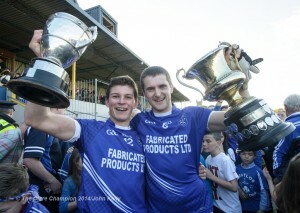 Hurling captain Liam Markham and football captain Micheal Hawes with the two cups following their senior football final win over Eire Og at Cusack park. Photograph by John Kelly. Sublime first half finishes from Conor McGrath and man of the match Podge Collins were the key scores. McGrath’s goal was set up by a quickly taken Collins free and with Éire óg switched off, McGrath finished calmly to the Colin Smyth’s net. Exactly half way through the first half Podge Collins jinked beyond the Ennis mens full back line and finished an exquisite goal. That put the double champions 2-4 to 0-2 ahead and in control. 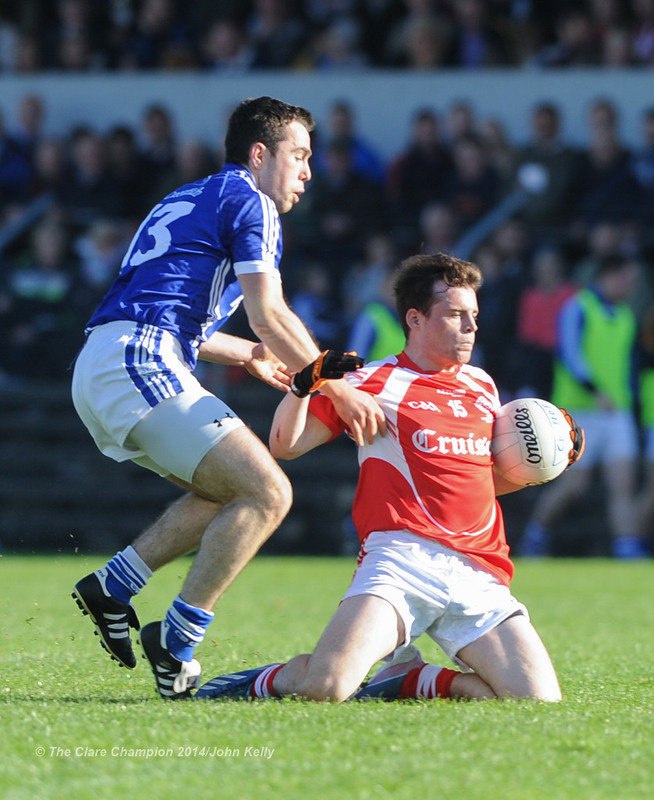 Podge Collins of Cratloe in action against Conor Brennan of Eire Og during their senior football final at Cusack park. Photograph by John Kelly. Earlier Collins had put over the games opening point, while Liam Markham and Cathal McInerney, from a free, added to their tally in the opening minutes. Come half time a brace of excellent Davy O’Halloran points helped Éire óg to claw their way back into the game somewhat. However they still trailed 2-6 to 0-8 at the interval with Markham kicking Cratloe’s last score of the opening half. To make a real game of it Éire óg needed to catch fire in the second half but instead the game petered out into a disappointing spectacle. 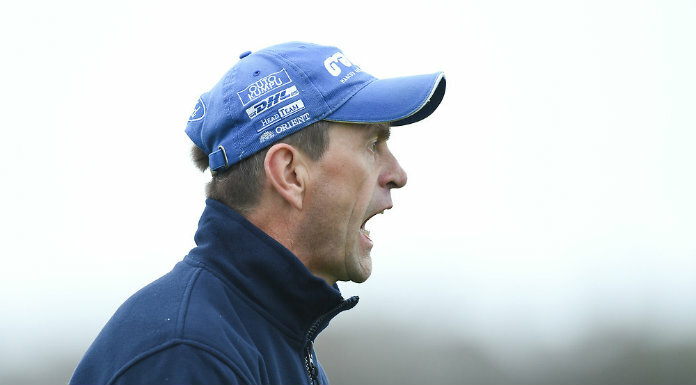 Cratloe added six second half points with John Galvin kicking his first score for his new club while Podge Collins landed two more sensational points. 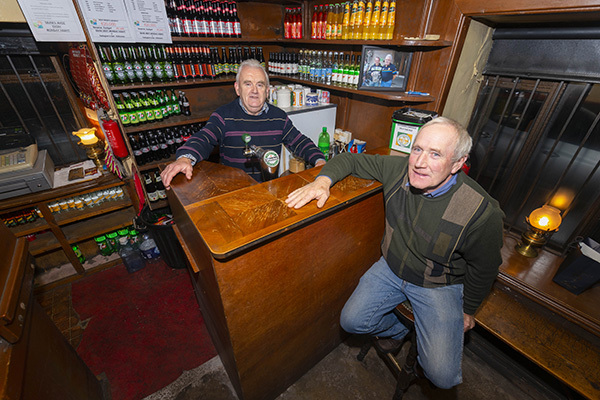 In contrast Éire óg couldn’t produce when they most needed it. They managed just three second half scores with defender Conor Brennan the only Ennis man to score from play in the second period. The first half produced some top class football but the second period disappointed in comparison. 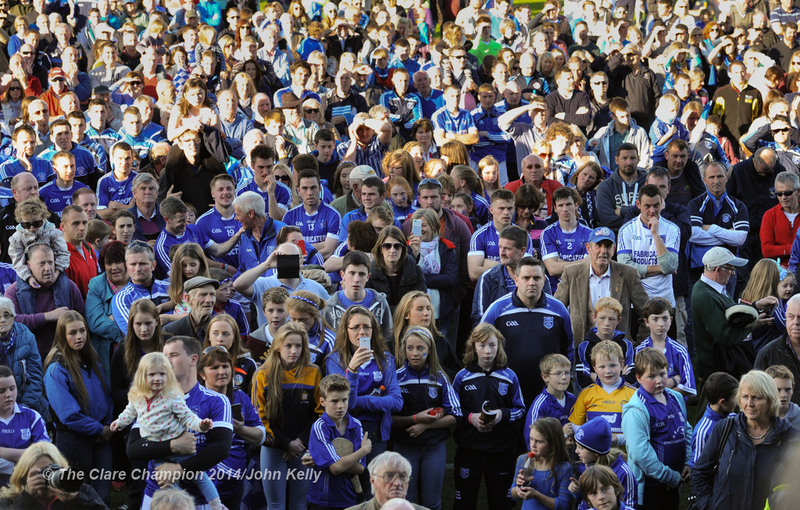 Cratloe however were deserving winners and now play the winners of the Limerick v Waterford Munster club game in the provincial semi-final on November 9. 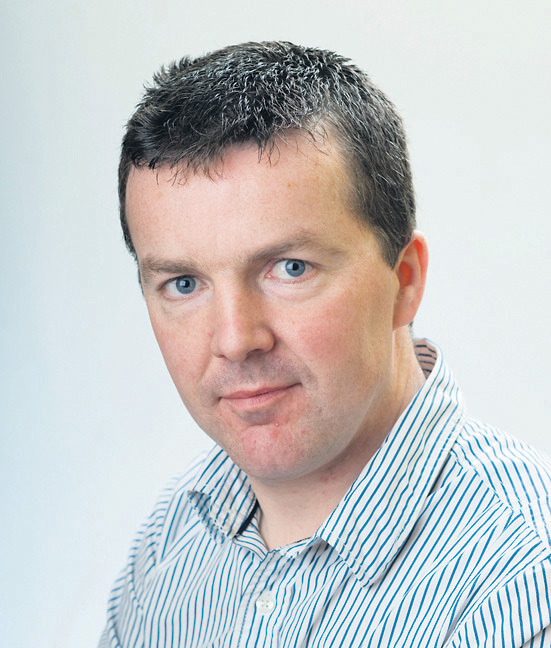 Cratloe: Pierce Deloughrey; Michael Hawes (captain); Barry Duggan, Seán Chaplin; Óige Murphy Liam Markham, Enda Boyce; Cillian Duggan, Fergal Lynch; Conor Ryan, Podge Collins, Seán Collins; Conor McGrath, John Galvin, Cathal McInerney. Subs: Shane O’Leary for Óige Murphy (52), David Collins for Cathal McInerney, David Ryan for Enda Boyce, Seán Hynan for Seán Collins, Wes Deloughrey for Fergal Lynch (all 58). Scorers: Podge Collins (1-4), Conor McGrath (1-1), Cathal McInerney (0-4, 0-3f), Liam Markham (0-2), John Galvin (0-1). Éire Óg: Colin Smyth; Liam Corry, Aaron Fitzgerald, Saran Butler; Seán Corry, Ciaran Russell, Dean Ryan; Darren O’Neill, Shane Daniels (captain); Seán O’Meara, David O’Halloran, Eoin Glynn, Eimhin Courtney, Stephen Hickey, Graham Glynn. Subs: Conor Brennan for Liam Corry (19), James Woods for Saran Butler (30-black card), David Reidy for Eoin Glynn (37), Dara Walsh for Stephen Hickey (46), Paddy O’Malley for Seán O’Meara (52), David Russell for Shane Daniels (injured). Scorers: Seán O’Meara (0-4f), Davy O’Halloran (0-2), Shane Daniels, Darren O’Neill, Stephen Hickey, Conor Brennan, Eimhin Courtney (f) (0-1 each). Yellow cards: Shane Daniels, Ciaran Russell. 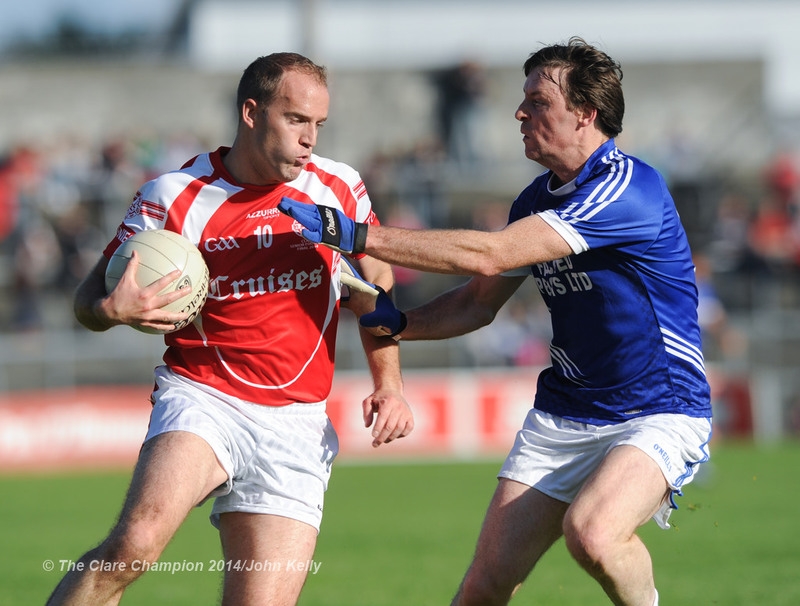 Conor Mc Grath of Cratloe in action against Eimhin Courtney of Eire Og during their senior football final at Cusack park. Photograph by John Kelly. 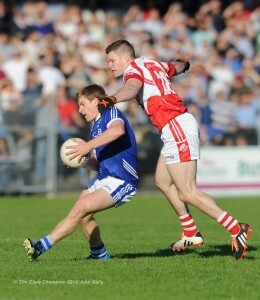 Stephen Hickey of Eire Og in action against Barry Duggan of Cratloe during their senior football final at Cusack park. Photograph by John Kelly. 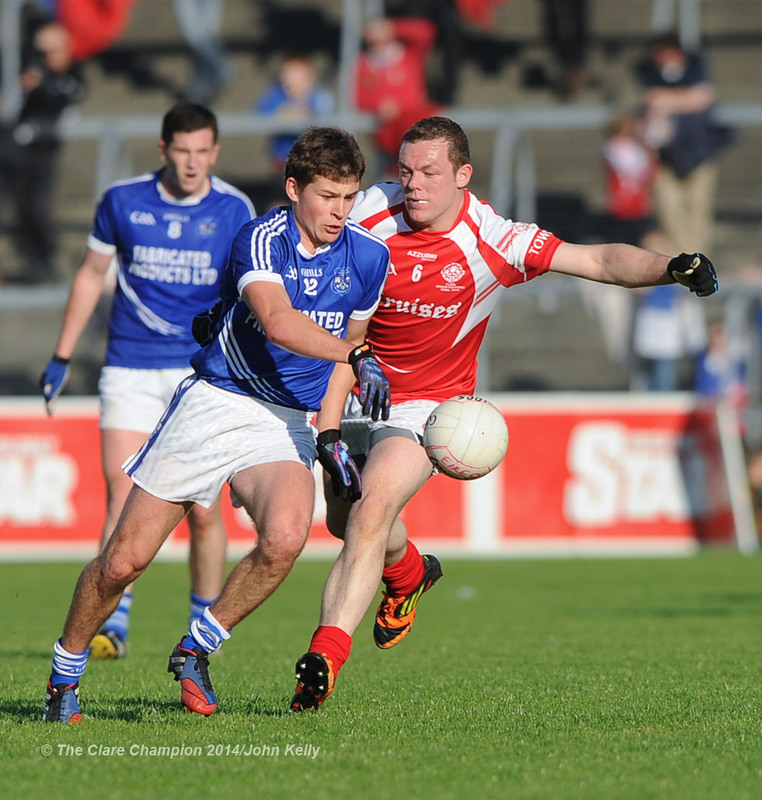 Podge Collins of Cratloe in action against Dean Ryan of Eire Og during their senior football final at Cusack park. Photograph by John Kelly. 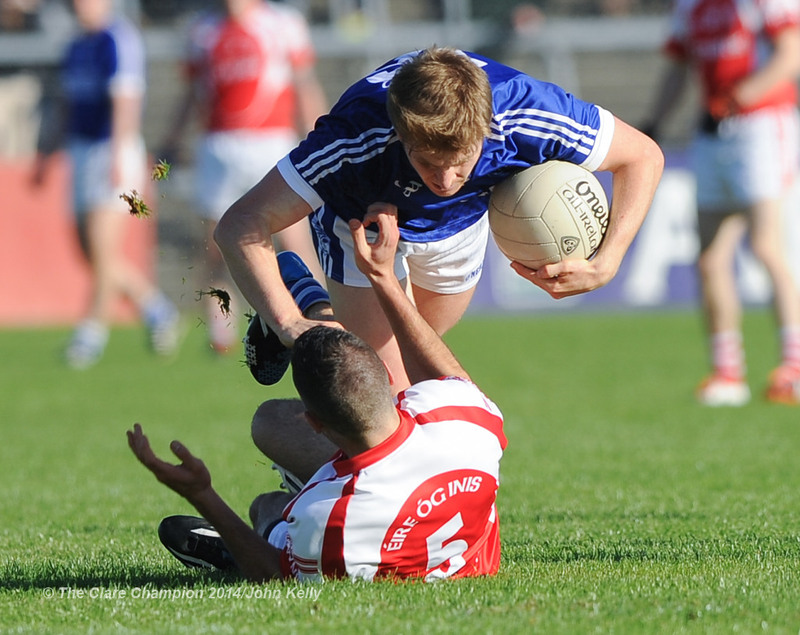 Liam Markham of Cratloe in action against Shane Daniels of Eire Og during their senior football final at Cusack park. Photograph by John Kelly. 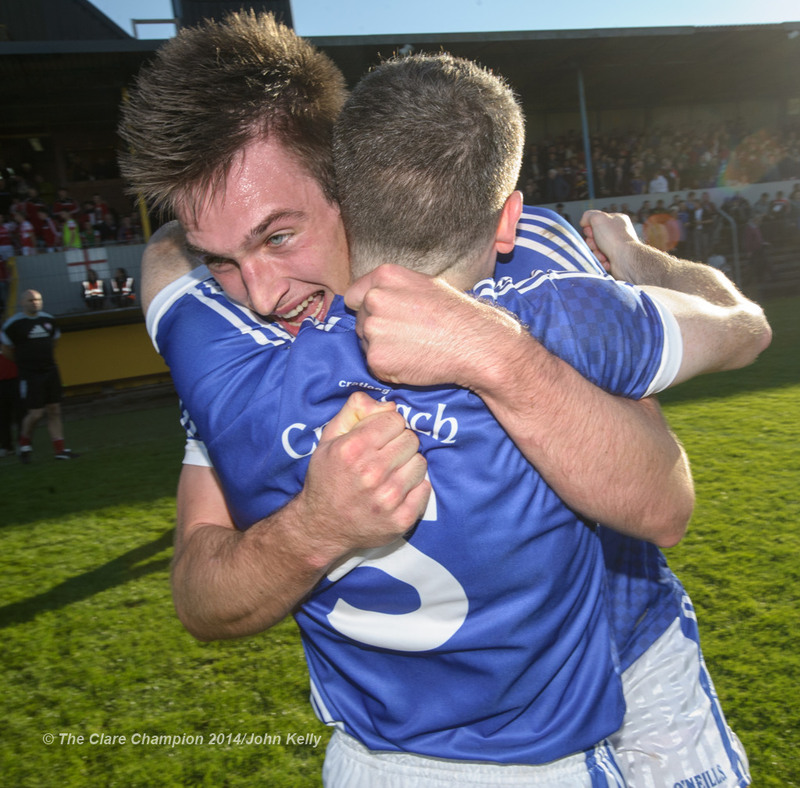 Conor Ryan and Martin Oige Murphy of Cratloe celebrate their senior football final win at Cusack park. Photograph by John Kelly. 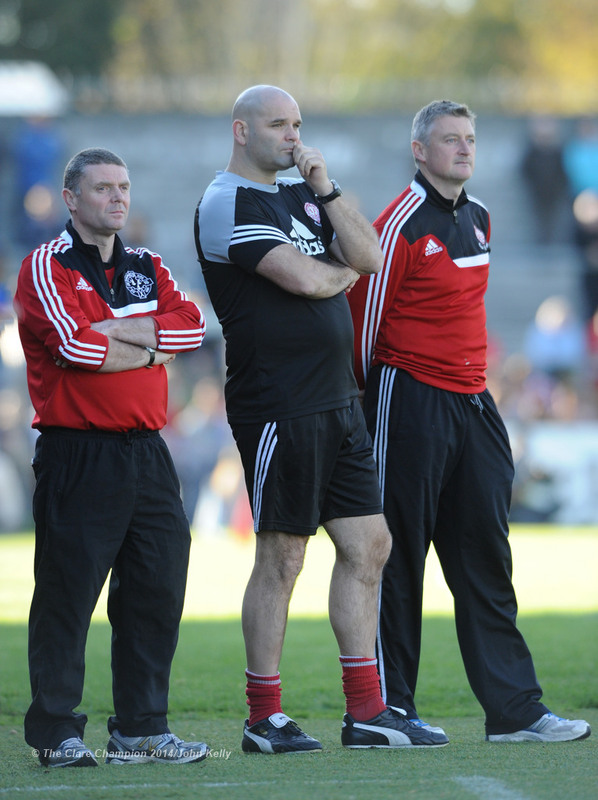 Eire Og manager James Hanrahan, right, and selectors Mattie Murphy and Cathal Shannon can only look on during the closing stages of their senior football final at Cusack park. Photograph by John Kelly. 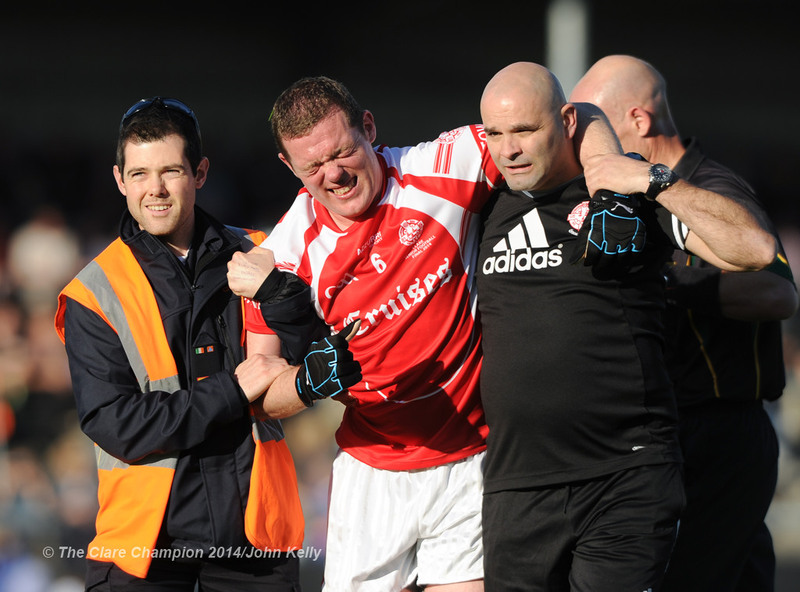 Shane Daniels of Eire Og is taken off injured near the end of their senior football final at Cusack park. Photograph by John Kelly. 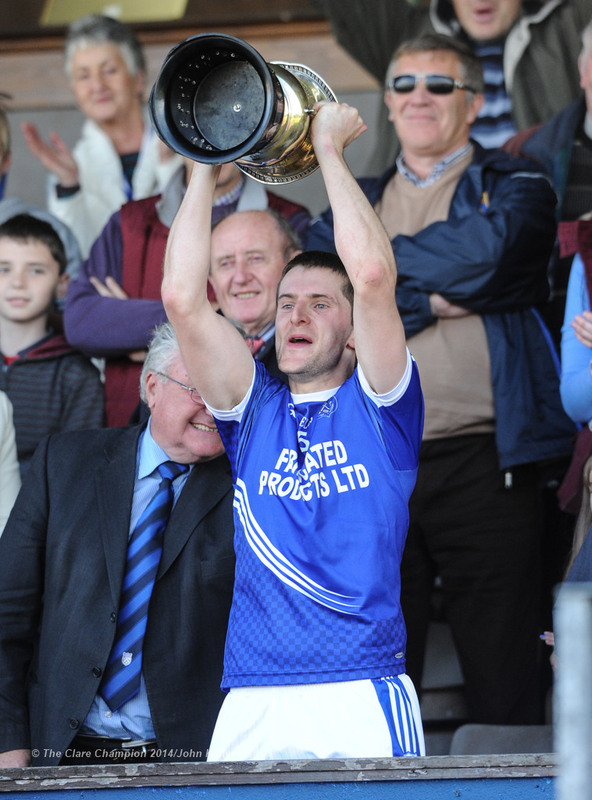 Micheal Hawes of Cratloe lifts the cup following their senior football final win over Eire Og at Cusack park. Photograph by John Kelly. 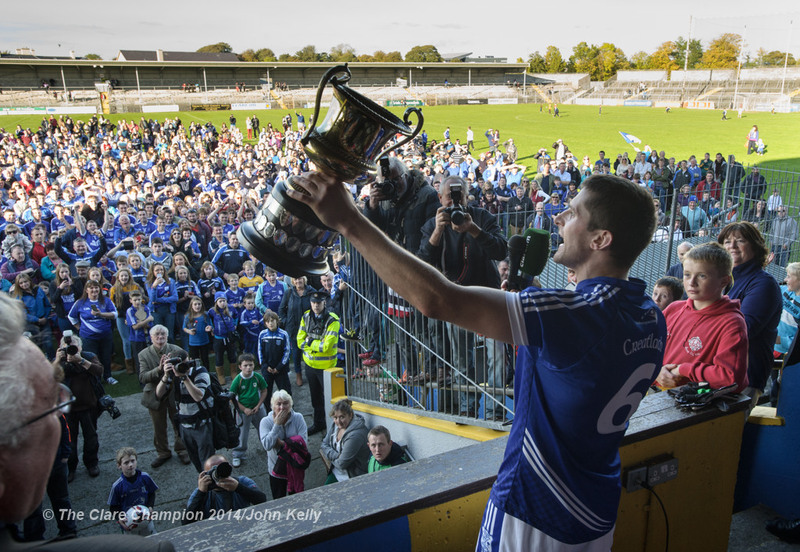 The Cratloe crowd look on as captain Micheal Hawes of lifts the cup following their senior football final win over Eire Og at Cusack park. Photograph by John Kelly. 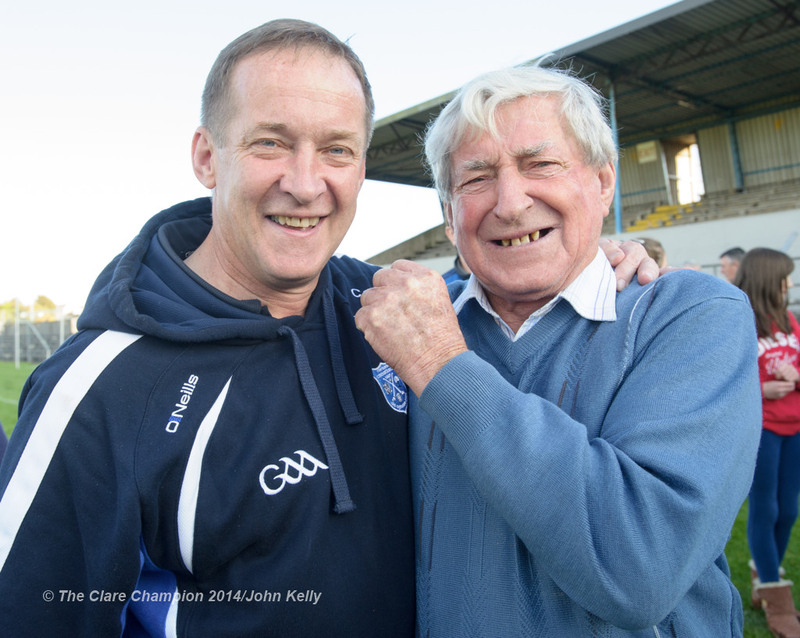 Cratloe manager Colm Collins is congratulated by his dad Cyril following the win over Eire Og in their senior football final at Cusack park. Photograph by John Kelly. 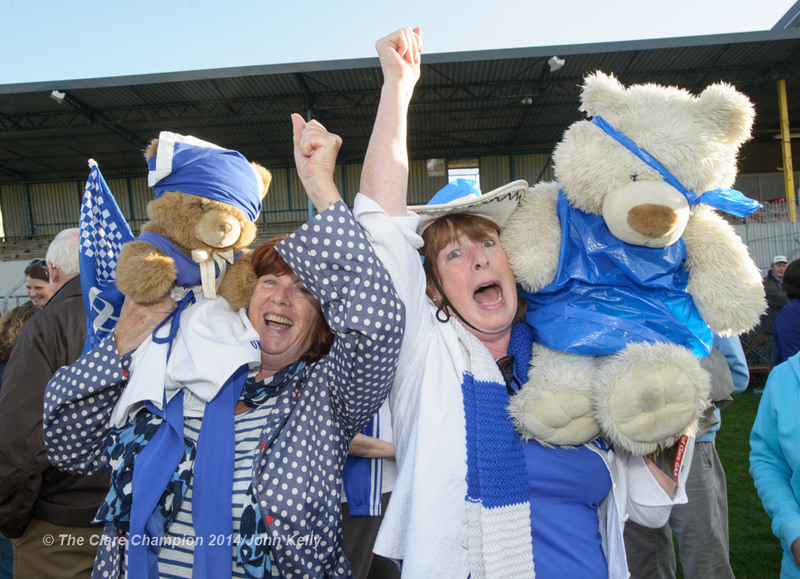 Cratloe fans Anne Mc Namara and Mary Hayes celebrate with their teddy bears following the win over Eire Og in the senior football final at Cusack park. Photograph by John Kelly. 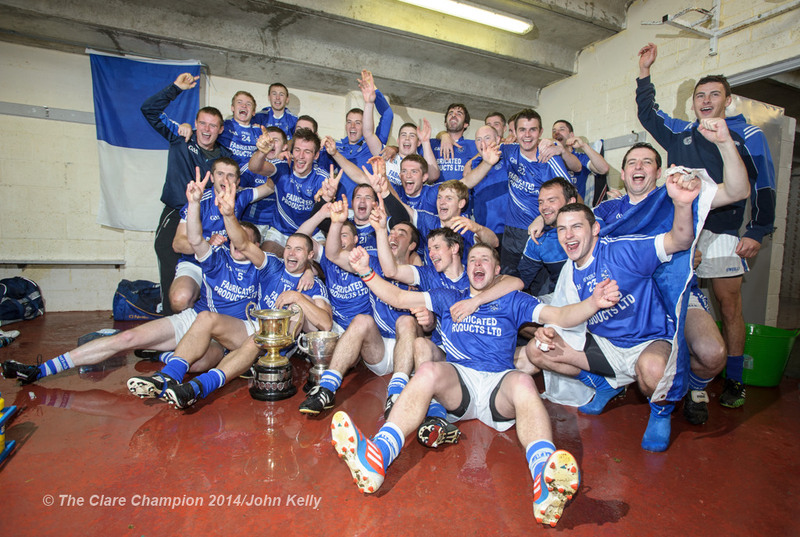 The Cratloe lads celebrate in the dressing room following their senior football final win over Eire Og at Cusack park. Photograph by John Kelly. 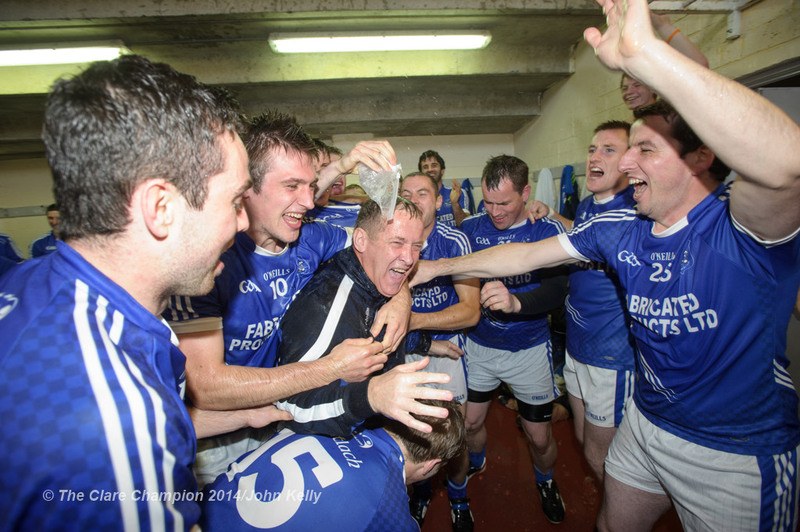 The Cratloe lads celebrate with manager Colm Collins in the dressing room following their senior football final win over Eire Og at Cusack park. Photograph by John Kelly.